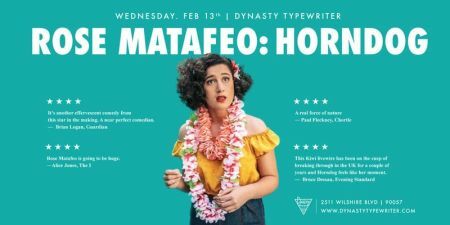 Rose Matafeo has kissed nearly 10 men in her life, AKA she’s a total horndog. But what is horniness? Is it that intangible essence of excitement and opportunity? A fire that flickers in the beating heart of every human being? Or is it simply wanting to bone everyone, all the time? Join Rose for Horndog; a brand-new hour of critically acclaimed stand-up, sketch and mid-20s angst. Horndog has enjoyed successful performances around the world with sell-out shows at the New Zealand International Comedy Festival, a Barry Award-nominated run at the Melbourne Comedy Festival, and most recently at the Edinburgh Festival Fringe where it was crowned Best Show at the prestigious Edinburgh Comedy Awards. The show was simultaneously highlighted as one of the best shows at the Fringe in the Guardian, Vogue, Evening Standard, The Mirror, Chortle, and British Comedy Guide.